QPST Tool v2.7.438 is a small installable application for Windows Computer, which allows you to flash or write the stock firmware on Qualcomm powered Smartphone and tablets. Here, we have managed to share the original and tested version of QPST Flash Tool i.e QPST Tool v2.7.438. QPST Tool allows you to flash the stock firmware and manage your Qualcomm Smartphone, Tablets. By using any of the following Mirror Link, you can get the tool on your computer. [*] How to use QPST Tool: If you want to learn to operate QPST Flash Tool to flash the Stock Firmware then head over to the How to use QPST Tool page. [*] Download latest version of QPST Tool: If you are looking for the latest version of QPST Tool, then head over to the Download Section. [*] QPST Compatible Firmware: If you are looking for the Stock Firmware which is compatible with QPST Tool then head over to FirmwareFile. [*] QPST Compatible Driver: If you want to download the USB Driver compatible with the QPST Tool, then head over to the Download Qualcomm Driver page. 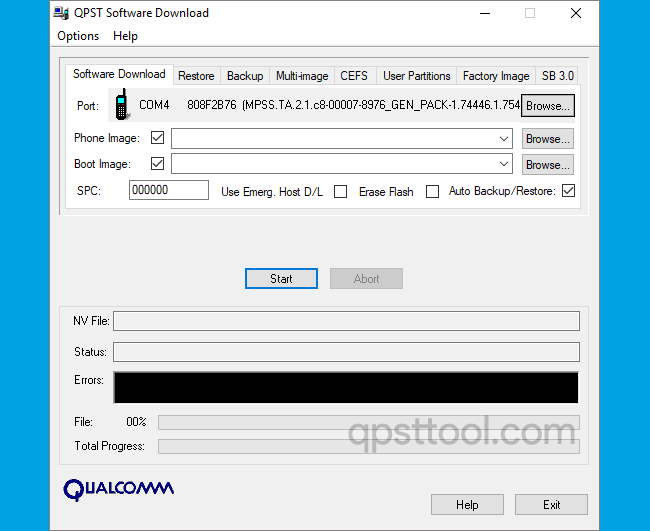 [*] Take a Backup: If you are going to use the QPST Flash Tool to Flash the Stock Firmware on your Qualcomm Smartphone or tablet, then we strongly recommend you to take a backup of your personal data, as flashing the firmware will permanently remove your personal data from the device. [*] Caution: Flashing the Stock Firmware using the QPST Tool will erase your personal data from the device permanently. So, therefore we recommend you to take a backup of your personal data before using the Tool. [*] Hot-Linking Not Allowed: If you want to share the QPST Flash Tool on any website, Forum, Blog then we request you to please share the page URL, instead of sharing the Direct Download Links. Copyright © 2018-2019 QPST Tool. All Rights Reserved.